While the city's Vision Zero plan tackles pedestrian behavior, engineering and drunken driving, it doesn't expressly target one of the most common traffic fatality-related dangers: distracted driving. They were about half a mile from where they were going. And then, a wrong turn. With the phone on his leg, telling him to make a U-turn, the driver turned the car into the left turn lane. As they turned, the passenger gasped. The driver closed his eyes. Then, the crash. The driver never even saw James Robison on his motorcycle. He was pronounced dead at the scene. “That was the only thing that the [driver] admitted. They said ‘I didn’t see them, I was on my GPS device at the time,’” says Austin Police Commander Art Fortune, who heads the Highway Enforcement Division. This crash was somewhat unique because distraction played a proveable role in what happened. Austin’s Vision Zero task force identified distraction as one of six main factors that lead to fatal or serious injury crashes. But especially in fatal crashes, it’s not so easy to prove it to a certainty. “I would say distractedness probably plays a major role in a lot of things, but it’s just so hard to prove because people aren’t going to admit to it,” Fortune says. Police just don’t know what was happening at the time of the crash. Especially in cases where a possibly-distracted driver was the only person involved and they died. Look through police crash reports from 2015 and you see some that could be caused by distraction. We’ll never know exactly what happened in these cases. But just look at all crashes, not just the ones where someone died, between 2010 and 2014, distraction or driver inattention was the number one contributing factor. Here’s the crazy thing: We all know this. We know using your phone while driving is really dumb. It’s dangerous. When you’re using your phone behind the wheel, you’re about as impaired as if you had several alcoholic drinks. Why do we keep using our phones while driving? Markman says because the probability that we’ll be in a crash because we’re distracted is relatively low, in the moment, we act as if the risk is zero. But of course, it’s not. The city put a new law in place last year banning handheld devices while driving. Austin Police have written about 7,000 tickets since they started enforcing that law last February. Yet, at least anecdotally, the problem is only getting worse. Markman argues these kinds of laws are little deterrent for people using their phones while driving because the probability of being pulled over for texting and driving is so low. "Afterward people go, ‘I shouldn't have been doing that,’” Markman says. “But in the moment they are thinking, ‘Well I'm not going to get caught doing this.’"
"The problem with a lot of things like texting and driving is it's not a guaranteed problem. Nobody plays Russian roulette with a gun that's full, right?" According to a 2013 study from the University of Wisconsin, laws banning phone use while driving only seem to serve as a deterrent for a few months after they’re put in place. But another study out of Texas A&M in 2014, found that texting bans in 19 states between 2003 and 2010 resulted in a 7 percent reduction in hospitalizations related to car crashes. Austin Police have recently started to crack down on violators of the hands-free law. They’ve started riding around in empty Capital Metro busses to spot people on the highway using their phones while driving. People like Mike Myers say we should be doing more. Myers has been thinking about this stuff for a while. Ever since April 9, 2014. That’s the day his daughter died. Mike Myers with a photo of his daughter, Elana. She died in a suspected distracted driving crash on April 9, 2014. Myers’ daughter, Elana, graduated from Bowie High School in 2013. She was in her first year at Texas Tech. She was just shy of her 19th birthday on the day she headed home to Austin from Lubbock. She never made it. It’s not clear exactly why she looked away. 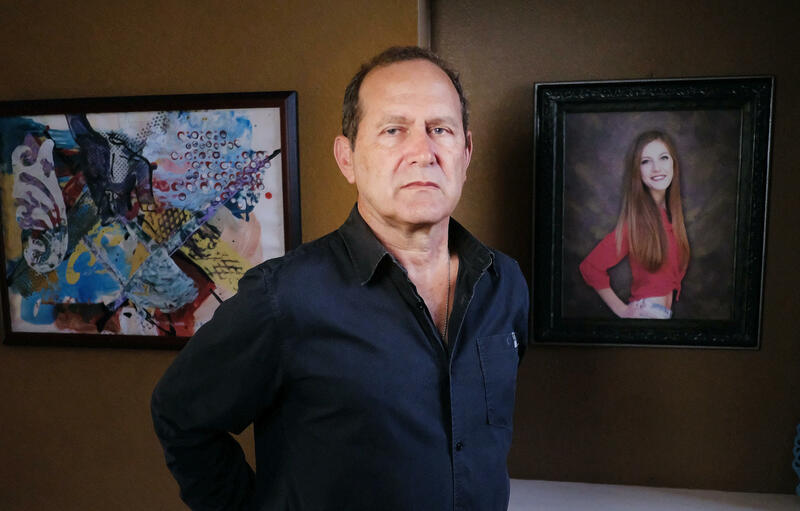 Since his daughter’s death, Myers has become an activist on the issue of distracted driving. He wants more education and stronger enforcement. Austin’s Vision Zero plan recommends looking at how other cities enforce their hand-free laws. But that’s really the only recommendation aimed specifically at distracted driving. The Vision Zero philosophy says it takes education, enforcement and engineering to reduce traffic deaths. Which left me wondering: Is it possible solve this problem with engineering? I put that to Billy Fields, who studies transportation policy, among other things, at Texas State University and is a member of Austin’s Vision Zero task force. "Speed is the biggest contributor in terms of fatalities. So when you have high-speed,wide lanes, we have problems." He says the typical engineering approach is to build wider roads to create buffers. “So we create lots of space. And what happens is if you make a mistake” -- say you’re distracted -- “you can have room to correct,” says Fields. On its face, that makes a lot of sense, right? Especially when a driver is distracted. It’s not just texting. There’s all kinds of distractions: looking away from the road, taking your hands off the wheel or just taking your mind off of driving. Phones are just especially bad because they distract in all three of those ways. So, narrower lanes can lead to safer driver behavior, Fields says. There’s nothing specific in Austin’s Vision Zero draft plan about designing roads to discourage distraction. More enforcement appears to be the main idea for addressing the problem. It seems distraction is one of those kinds of bad driver decisions that defies simple solutions. To some degree, the choice is ours. Mike Myers, whose daughter died in an apparent distracted driving crash, told me something that stuck out about that. As prepared as he made sure Elana was, she made a mistake. It’s a mistake that a lot of us make. Maybe one some of us have already made it today. Sadly, it ended up costing Elana Myers her life. It’s unclear what effect Vision Zero will have on distracted driving here in Austin. Maybe that part is just up to us. So far this year, 82 people have died in Austin as a result of more than 70 crashes on the city’s roads. At the same time, this is the first year of the city’s hands-free ordinance, a law intended to make driving safer. So how many of this year’s deaths have been because someone answered a call or responded to a text? Texas lawmakers in a transportation committee say they want to make 2015 the year Texas bans texting and driving statewide. Starting today, you won't be able to have your phone in your hands while driving your car, or while riding your bike. The Austin City Council passed an ordinance in September prohibiting use of devices unless drivers are at a complete stop, or if there is an emergency. Those caught in the act by Austin police face a citation for a Class C misdemeanor, which will carry a fine of around $300. While some studies suggest devices with hands-free capability doesn't necessarily reduce safety risk or increase reaction times, the move is an extension of the city's current ban on using devices while on the road. But what do Austin drivers think of the ban, and how Austin police plan to enforce it?